The Pride of Hillsborough Raider Marching Band had another very successful season due to their hard work and dedication. The Pride of Hillsborough Raider Marching Band led by Julie Haran, Director of Bands and Nicholas Clipperton, Associate Director of Bands. This year’s members are: Devansh Agarwal, Ariana Andrews, Joseph Angeline, Ciera Appau, Alex Ascencio, Swati Bangalore, Ellis Bartolomeo, Louis Bartolomeo, Alyssa Benito, Lauren Bevacqua, Danielle Biondi, Madelyn Blau, Rachel Bruno, Chloe Bynes, Caroline Cappabianca, Meg Cappabianca, Luke Carlsen, Thomas Cavagnaro, Evelyn Chacon, Ana Clara Ramirez, Yanira Crawford, Hailey Crino, Melani Cruz, Akindu Dasanayake, Isabel Diaz, Brandon DiCorcia, Alexander Duma, Eric Duma, Isabel Dutta, Vincent Ferrera, Phoebe Filoramo, Soumil Girdhar, Elizabeth Gladstone, Victoria Gladstone, Ian Golden, Emma Griffiths, Chloe Griggs, Michael Guarnieri, Parin Gupta, George Hart, Teresa Harvis, Andrew Hoefele, Kyle Horst, Alan Ji, Merissa Joju, Katelyn Kazantzis, Caitlin Kazim, Shreya Kelshikar, Leena Khashab, Benjamin Khoury, Sarah Klein, Hari Kumar, Sarah Liu, Connor Lydon, Kaitlyn Ma, Alexandra Magee-Lopes, Sakhya Mandava, Carter Marso, Matthew Martinez, Alyssa Massi, Matthew McCloskey, Grace McHugh, Reilly McHugh, Daniel McCloone, Ethan Miller, Alexander Mindish, Stephen Mondoro, Jonathan Morrone, Tamiyah Moses, Aditi Nandan, Aidan Neuberger, Craig O’Connor, Kevin O’Connor, Evan Obenauer, Quinn Obropta, Suma Panamgipalli, Asha Patel, Sheasha Patel, Aidan Perkins, Isabel Quiampang, Emily Rambo, Ayush Rastogi, Tanya Reddy, Sennet Senadheera, Leonard Shapiro, Jake Smith, Jaclyn Spinrad, Zachary Stept, Adam Sutton, Girish Swaminathan, Eka Tawe, Sydney Thiemann, Stephen Trampe, CJ Tuck, Surya Vaidy, Andrew VanLangen, Elynna Volkova, Aaron Waller, Amy Wang, Alana Wojciechowski, Jessica Wu, Sophia Yanuzzelli, and Olivia Zielinski. The Pride of Hillsborough Raider Marching Band competed at the US Bands Mid-Atlantic Regional competition on November 3, 2018, placing first in Preliminaries with a score of 97.4 and receiving the Caption Awards of Best Music and Best Overall Effect. The band advanced to Finals and scored first place with a score of 98.2125 and received Caption Awards for Best Music, Best Overall Effect and Best Percussion. They placed second overall at the State Championships winning Best Music and the Esprit de Corps Award for the highest music score of the competition. 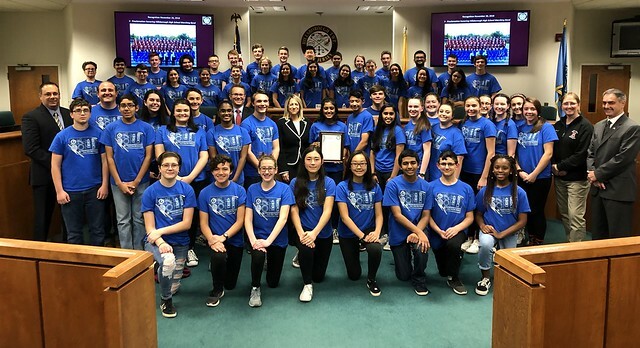 The Hillsborough Township Committee commends the Pride of Hillsborough Raider Marching Band for the honor they have brought themselves, their school, and our community through their many achievements.